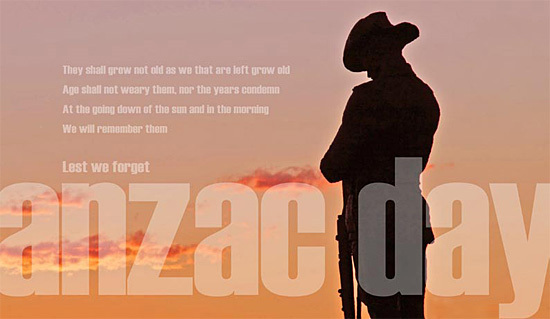 Ninety-five years ago to this very day, our two nations first fought side by side under the Australian and New Zealand Army Corps (ANZAC) banner – our soldiers landing together at dawn on a desolate beach on the Gallipoli peninsula in Turkey. It was a military bungle by the British commanders - but the attitudes, actions, and courage of the Australian and New Zealand soldiers both at Gallipoli and over the many battles and years since, stoked a burgeoning sense of independent identity and nationhood. Despite being so far away from the conflict, and in no direct danger ourselves, more than 100,000 New Zealand troops and nurses served overseas during the First World War, from a population of just over one million. 42% of men of military age served. Over the past century, Australia and New Zealand have contributed greatly on the world stage in many ways and in many diverse areas, generally 'punching far above our weight' given our geographic isolation and small populations - and in some ways this can be traced back to the values associated with 'the ANZAC tradition'. Along with book reviews and author features, and my fulltime job as a legal journalist, I freelance write articles for New Zealand and overseas magazines and newspapers on a variety of other subjects, including sport, travel, and business. But one of the articles I am most proud of (not necessarily my best article, but one I'm proud of writing) is one I wrote for the April 2009 issue of WildTomato, interviewing modern military personnel about the ongoing importance of Anzac Day. If you have time, please take a few moments to read that article here. I had no particular connection to the Gallipoli events but one of the most moving things I have ever done is travel there and participate in a Dawn Service. The day before Anzac day we went to Anzac Cove and walked around through the trenches and the various memorial sites to soldiers from all countries, including the Turks, I took along a copy of Patsy Adam-Smith's The Anzacs which I read bits and pieces of in between bawling my eyes out. It is simply astonishing to look at the physical geography of Anzac Cove and wonder how anyone survived. The next morning we were up very early for the service, along with hundreds of other, mostly young, Aussies and Kiwis and it really was quite simple and beautiful. I'm not always terribly impressed with the way our politicians (here in Aus, can't speak for yours) co-opt the Anzac legends and mythologies for their own purposes but I was very moved by the service in Turkey, especially as there were also a lot of Turkish people there and they were so respectful of all the Kiwi and Aussies who travelled such a long way to be there. Craig on ANZAC day there are many of us in Britain who will never forget the sacrifice the Aussies and Kiwis made in both world wars. My late mother and mother in law were linked in that one lost an elder bother, and one lost her father in the Great War. My children's great grandfather died while serving in the Royal Australian Navy when submarine G8 was sunk in the North Sea. I also remember when researching to find my uncle's grave in France and noting a Commonwealth War Grave site where two British soldiers and forty four New Zealanders were buried.